Class Format: On-demand teleclass to take anytime, at your convenience. You will receive links to 9 hours of MP3 recordings (from a live class which includes the questions, comments and interactions of the participants with the instructor) and PDF’s containing 99 pages of detailed handouts. Those of us who are blessed to love and be loved by animals know the unparalleled joy and fulfillment that comes from animals living in our hearts and lives. Once we experience a profoundly deep connection with animals, there is no turning back. Animals and their love stay in our souls, once we’ve let them in. And we are better for it, more complete, more whole, more compassionate, and often transformed. In loving so much, we open ourselves to an exquisite, rewarding intimacy, but also to inevitable searing pain when we lose them. 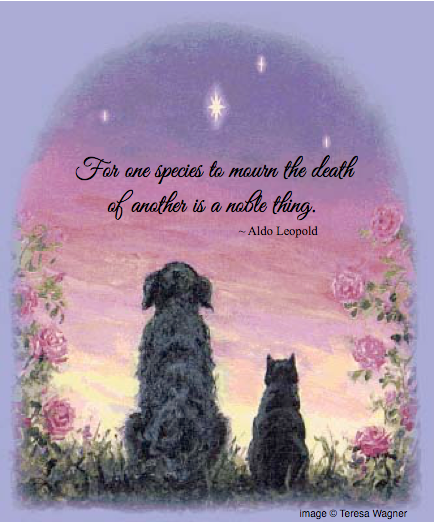 When our deeply beloved animals die, the hole left in our hearts and in our physical lives can be devastating. Our hearts break with the heaviness of grief. Without them, we can sometimes feel as if we are no longer whole, but fractured. 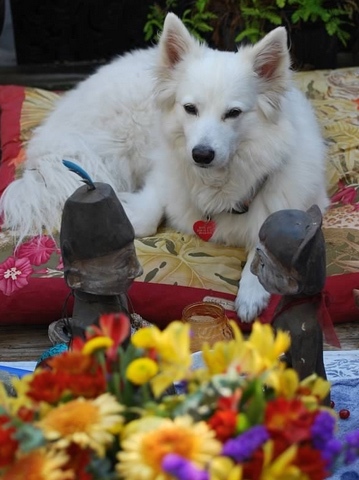 This healing pet loss workshop can help you both cope and restore your sense of wholeness. To face our grief and work through it in order to heal, is an act of courage. We need support to garner this courage to journey through such loss. This very personal healing pet loss workshop was designed to enable your courage and to bring you loving support and practical tools to help you heal your heart and experience greater peace. As a participant in this class, you are gently and lovingly provided with an opportunity to express your grief, understand your grief, explore many strategies to cope with and heal your grief, and identify and find comfort from the mutual gifts and lessons of the relationship—the legacies that transcend physical death. Though the class encompasses the concepts from the audio book Legacies of Love™ (included with this class purchase), there is far more opportunity through the numerous and diverse exercises and presentation of material in the class to receive practical and more in-depth help for the the healing of your heart. Explore the legacies that transcend physical death — the mutual gifts and lessons of the relationship — and ways to integrate them into your way of being. This is perhaps the finest tribute we can make to our animal loved ones. the loss – no one else. How Do I Integrate the Legacies of Love into My Life, Into My Way of Being? The material from this healing pet loss workshop will be read over and over again….as needed! The exercises were general enough to be applicable to everyone and to whatever stage of grieving we are at, yet specific enough to allow us to make them personal. The handouts were great, including the outline at the beginning and end of each set – this helped provide a sense of where all the information fits. Various quotes were thoughtfully placed throughout, and they were very appropo for the material. I got a much better sense of how I can help myself reconcile feelings of guilt, and still honor my animal’s soul and life. I also got a much deeper understanding of the word and meaning of “legacy”. Teresa presented all of this with such love and sincerity. She is in a class all of her own, and is a very special gift to all of us and the animals of this planet. I cannot say enough good about this class. Teresa is very gifted and intelligent, a rare combination. I loved every bit of what she taught, and I am still digesting a lot of it. 8 yrs after losing my cat, I still continue to process and learn. I found a level of healing that I don’t think I would have gotten to without the class. I appreciated the complete honoring of animals and animal loss as equal to human loss. This provided a framework to go deeply into the exercises and my own grief. I learned about layers underlying the emotional pain that I have felt since the losses. Some I was somewhat aware of, others were just barely conscious. The class brought me clarity about areas that I need to work on for myself. And it gave me a chance to honor these wonderful animals in new ways and see all of the amazing gifts they brought to me. The exercises gave me a new perspective on grief, new ideas and language for looking at the healing that I need to do. I think especially helpful were the exercises on looking at unresolved issues from the past and looking at things my animals gave me that I want to learn to give myself. This class helped me to understand what it is to actually do grief work and not to be passive, stuff it and just wait for the intense pain to subside. I can also see how past grief has hindered me and ways to resolve the grief I’ve never faced. Hearing the issues others in the class have faced and feelings they have helped me to know that I’m not alone, not weird. Also I’ve gained hope about the life my past fur family members are still alive in spirit and that I can still get in touch with them if needed and for comfort. I have felt supported and able to express the pain and feelings I’ve had. I would also love to repeat this class in the futureI’ve gained tools to handle current and future grief. Things I liked most about the class were expressing myself in the heart paintings, the support of Teresa, the beauty of how others honored their pets, seeing the diversity of the species that were so loved and knowing that love doesn’t have a species limit, that love is love, and the feeling of peace that I found even though it’s painful to work through the process. Hearing how others connected with lost pets and the hope that I can possibly be sure of a future connection with Ben and other loved pets I’ve lost. One the things of lasting value to me from this class is realizing how much I gave my animals and working through my feelings surrounding my loss. Parts that were most helpful: The Loss History Graph was eye-opening for me. Feelings I was not consciously aware of came up for healing. The questions to ask yourself when you’re feeling guilty were helpful to me. It helped me sort out appropriate and inappropriate guilt and helped me to release some of it. The What I’m Creating part of the last exercise helped me to find my voice. The organization of the handouts was helpful and presentation in small doses, so no one part or exercise overwhelmed you. Use of art to express feelings was helpful. The use of personal stories to illustrate concepts was helpful. What a healing pet loss workshop experience! Amazing. Embracing. Loving. Enlightening. Never to be forgotten. Teresa Wagner has a gift, which she is generous enough to share with the world. Not only does she convey love through her words, but through her voice and her mannerisms (yes, by phone). I was blessed to have had her come into my life. I know that I have much more work to do, but she put me on a wonderful path. A very supportive space for exploring the pain of the loss and the possibilities of healing. Teresa was wonderful and gave us excellent material to work on. She presents a wonderful balance of the emotional material and the spiritual material which is difficult to find anywhere else. It definitely provided a very supportive structure for me to begin healing around the loss of my beloved dog. It was too much for me to work on emotionally in the 4 weeks (while also having a challenging job) but it definitely gave a material to work on as I complete my process in my own time. The meditations Teresa let were wonderful. It was also wonderful to hear others share their stories. I liked the idea of imagining my dog talking about what gifts she had received from me. It was a beautiful experience to be with each other’s grief process and use some of the tools that Teresa offered us, along with the energetic support of the group. In the part on healing the deepest wounds, some of the work in the handout really helped me reveal a few core components of the grief. Having that aha experience was both a release and a relief. I was grateful to participate. I got to honor my own companions who have passed, along with being able to listen to, feel and honor the others in the group and their relationships. The most positive experience of this class was being with Teresa’s loving, compassionate presence. You will not “get over” the loss of a loved one, you will learn to live with it. You will heal, and you will rebuild yourself around the loss you have suffered. You will be whole again, but you will never be the same. You are just as important as your loved one who has died. You do not dishonor your loved one by honoring and taking care of yourself. Treating ourselves with the same tender lovingkindness with which we treated our animal loved one brings healing, wholeness and peace. You took loving care of your animal in times of joy and through times of illness and challenge. Now it is time to take loving care of yourself. The purpose of including the Legacies of Love healing pet loss workshop as a requirement in the Animal Loss & Grief Support Training and Certification Program is to help insure that we bring not only an academic understanding of grief to our work with clients but also an applied, integrated, personal wisdom from our own losses and healing. If we have not garnered the courage to actively, directly and thoroughly explored the pain and healing process of our own losses, and bring only an intellectual understanding of grief to our client relationships, we shortchange both ourselves and those we serve. Integrating our awareness of and learning from our own challenging, painful healing experiences into our repertoire of knowledge and skills as a grief support practitioner is a necessary step, and a recurring one, on the path of our continuing professional growth and competence. We cannot truly help someone walk a path that we have not yet walked ourselves. Often, we do not need to even verbalize a thing about our personal experiences of healing our grief when working with clients (and often shouldn’t). But inside, there are times that we know we’ve been where a client has been in their pain. We’ve experienced some of the same type of loss, dilemma, overwhelm, confusion, trauma and the challenges of healing that clients are experiencing at a similar level of intensity or circumstance. Clients feel this, they sense it about us, making them feel more safe with us. And that safety helps them open up to more support and resources to heal. Shared experience of a particular type of pain—especially when the pain is related to a disenfranchised loss such at pet loss—creates an energy of empathy that cannot be duplicated by anything else. No exposure to information about grief or any healing process from books, classes, symposiums, advanced degrees, though these are certainly valuable and important means of learning, can replace the empathy from shared values and experience. Exposure to information can make us sophisticated or learned about this topic and builds our intellectual understanding of loss, grief and healing, which serves an important place in our role as grief support practitioners, but it is only by integrating what we’ve learned into our own lives and consciousness that we create wisdom: How have we applied the knowledge we’ve been exposed to? How have we made sense of it in our own healing? How has it changed our consciousness? Do we understand the power it holds for helping us to continue to grow and to be a witness to other’s pain and healing? In the Grief Support Skills class and the Essential Counseling Skills class we review in detail the ethics and boundaries of how and when to appropriately self-disclose or not self-disclose aspects of our personal experiences with clients. But the first step is being clear about our own learning and growth from loss, which is facilitated in this healing pet loss workshop.